What is Danish krone LIBOR? The London Interbank Offered Rate (LIBOR) is an interest rate based on the average interest rates at which a large number of international banks in London lend money to one another. The official LIBOR rates are calculated on a daily basis and made public at 11:00 (London Time) by the British Bankers' Association (BBA). We publish the LIBOR rates on this website later the same day (we are not allowed to publish realtime LIBOR rates). Until the beginning of 2013, LIBOR rates came in different maturities (overnight, 1 and 2 weeks and 1, 2, 3, 4, 5, 6, 7, 8, 9, 10, 11 and 12 months) and different currencies (the euro, US dollar, British pound sterling, Japanese yen, Swiss franc, Canadian dollar, Australian dollar, Swedish krona, Danish krone and New Zealand dollar). However, the BBA decided to discontinue LIBOR fixing for a number of currencies (NZD, SEK, DKK, AUD and CAD) and maturities. As a consequence, the Danish krone LIBOR rates on this page have not been updated since the last fixing on March 28th 2013. In the following table we show the latest Danish krone LIBOR interest rates. For more information and charts, click on the links in the table. 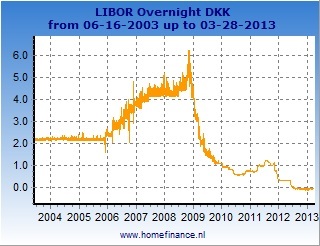 The left charts show all the Danish krone LIBOR rates from the start. The right charts show the rates during the latest 12 months. 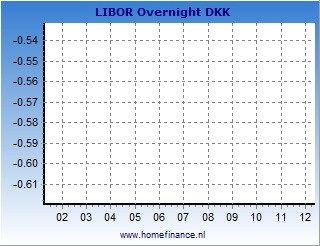 You can select all available Danish krone LIBOR rates (maturities). LIBOR is a registered trademark of the ICE Benchmark Administration (IBA). Neither ICE Benchmark Administration, nor the ICE LIBOR contributor banks, nor the designated distributor of ICE LIBOR from time to time, can be held liable for any irregularity or inaccuracy of ICE LIBOR (for details, see here).